TOP Lake Hill trekking, lake trekking & family lake trekking course! See all of beautiful Lake Toya in one steep with this scenic mountain course! *Please see green season program below URL. 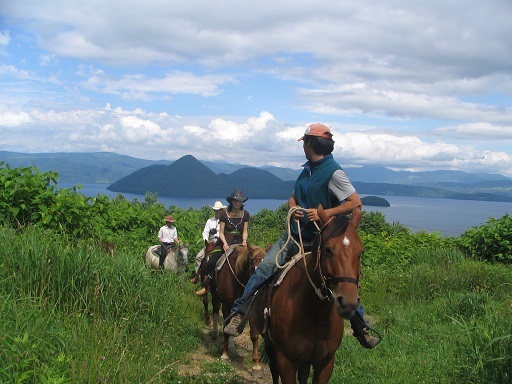 With scenery and a unique environment not found anywhere else in the world, Lake Toya is the perfect spot for experiencing a full-featured nature tour on horseback! A full-fledged course with a steep route up a hill. Enjoy spectacular views, wild birds and nature. Even beginners can enjoy. You can overlook the whole lake from this route. Enjoy! Going through a gradual slope, even young kids can join if he/she isn't afraid of horses. Winter horse riding is also an attraction. Feel the coldness of winter in Toya. 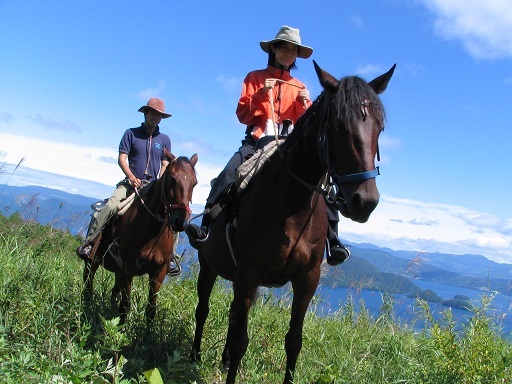 Our guide will lead children's horses for the "Family Trekking." 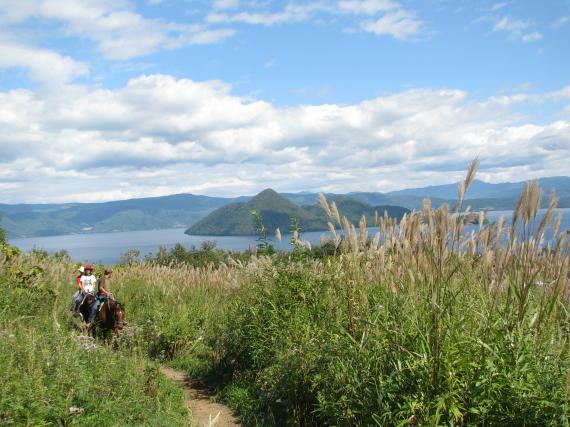 You will enjoy scenery of Lake Toya through the Four Seasons. ⋆Program does not accept a child from 27 February for safety reason（In the thawing season）. * Lake Hill Trekking is available from Jan 16-Mid March. Please let us know the time of your choice when you book. Please be notified that your final booked time may be earlier or later depending on availability. * All courses are open to beginners. * The Lake Hill Trekking course requires determination and endurance. * Minimum height 140 cm for Lake Hill Trekking and Lake Trekking (no age limit). * Children under 140cm can join Family Lake Trekking only. * The Family Lake Trekking course is open to families of 3 or more. Maximum 2 children under 140 cm per group; our staff will lead children's horses. * Please wear long sleeved shirt and pants, along with comfortable shoes such as sneakers. Rental boots are also available for a separate fee. * As we will be riding in the forest, please be advised that your clothing may get a little dirty or catch the smell of horses afterwards. * Please come 10 mins prior. Take Route 230 from Sapporo in the direction of Toyako Onsen. We are located adjacent to the gondola station of Windsor Hotel Toya and restaurant Pittore. Signs are placed along the road. 5 mins cab ride from Toyako Onsen Bus Terminal. Buses run from Toya JR Station, Sapporo Station, and New Chitose Airport. * Programs are not held at the beginning and end of the snow season. * Lake Hill Trekking is not available during the snow season. - Your child must be small as we use 1-person saddle. - Our guide leads the horse and you cannot take the reins. With panoramic views of Lake Toya, Mt. Usu and Mt. 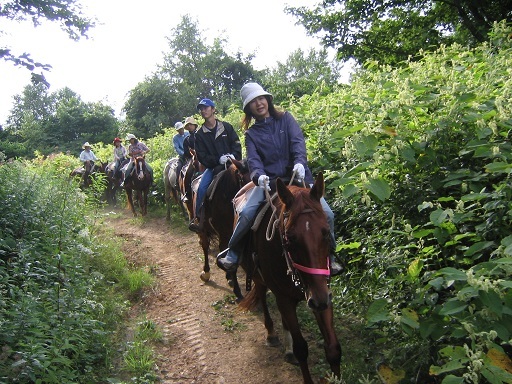 Showa Shinzan, our guest ranch is the perfect place to enjoy horse trekking. On our genuine mountain trails, everyone from total beginners to experienced riders can enjoy horseback riding to their hearts' content!